Finalist Best Bridal Retailer 2011. 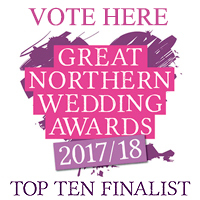 Winner Best Bridal Retailer North 2008. Winner Best Bridal Retailer 2006. Finalist Best Bridal Retailer 2004. Your wedding dress is the most important dress you will ever buy. We aim to make choosing your bridal dress a joy from start to finish. Based in Colne, Lancashire, we are the only bridal wear and wedding dress retailer in the north west to have won the UK 'Best Bridalwear Retailer' award. Brides travel from all over Lancashire and the North West of England to try on wedding dresses from some of the country's best bridal wear designers. These include wedding dresses by Allure, Augusta Jones, Brides Desire, Enzoani, Suzanne Neville and Jack Sullivan. Our bridal wear consultants are specially trained to ensure that we match your criteria to the perfect wedding dress. Other bridal wear includes bridal veils, bridal tiaras, bridal shoes and gorgeous jewellery to complement your wedding dress. Come and visit us soon at our stylish store in Colne, Lancashire to see our wide range of designer wedding dresses. Our shop within the town centre is on the main road to Burnley and Skipton.